Is America really the great melting pot, or is it – and does human nature dictate that it must always be – only a morass of cultures in steaming conflict? 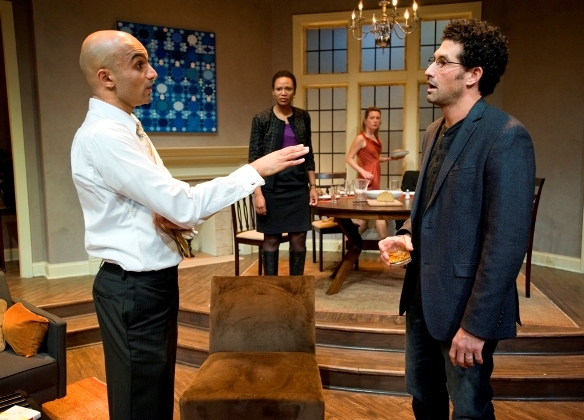 Ayad Akhtar’s stunning new play “Disgraced,” now in its world premiere staging at American Theater Co., opens a window onto the American dream to reveal a bitter brew of ingredients that boil and burn, but cannot coalesce. While Arca has not formally announced plans to take “Disgraced” to New York, such a move seems not only likely but eminently worthy. Ahktar’s tightly woven, provocative and surprising script should give pause to the most cross-culturally empathic viewer. In a deeply troubling, indeed sorrowful way, it answers Rodney King’s rhetorical question: Can’t we all just get along? The answer offered in “Disgraced” is: Sure, of course – up to a point, or perhaps down to a certain core level of cultural essence, a place where We, compatriots and friends of diverse ethnicities, separate along a timeless divide between Us and Them. 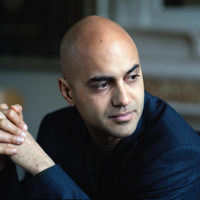 Amir is an American lawyer – a very smart, successful and ambitious one — of Pakistani extraction. He has Muslim roots but disavows any interest in religion. He just wants to be accepted for the relentlessly upward bound American that he is. Amir is married to a white woman, Emily, a painter. His best friends are a Jewish art curator called Isaac and his African-American wife Jory, another lawyer who works at the same firm as Amir. If Amir appears to be the most driven among them, they’re all good friends who spend a lot of time together. You’d say the four of them share a great mutual respect. And this evening, Isaac and Jory are coming over to dinner. But the picture is not quite what it seems. There’s something out of joint with headstrong Amir, he of the $600 shirts, a man just-this-close to a partnership in the law firm. 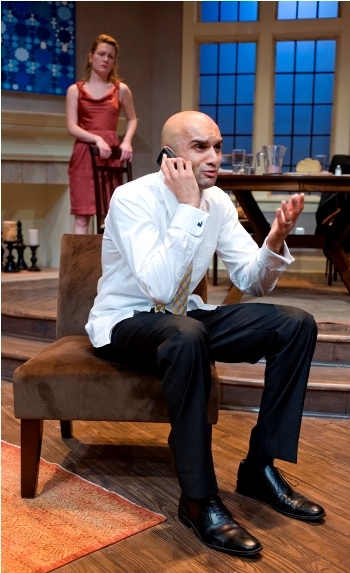 In the lean, confident persona of Usman Ally, we observe a man on a mission, hell bent, flying low – who hits a speed bump. They’re called speed bumps for a reason. Smack into one at 80 miles an hour and see what happens. There’s a good chance you’ll lose control, like Amir. You can’t help admiring Ally’s supercharged lawyer. He’s a regular American, his own man. Lifted himself up by his own bootstraps. And he’s devoted to his beautiful, talented wife, played with touching vulnerability by Lee Stark. So much the worse to watch him self-destruct. A couple of stiff drinks when the guests arrive are all it takes to let the demons out. A shocking comment draws an incredulous retort. Sharp words follow, then bitterness that taps into deep veins of poison from Jew, black and this man whose roots are now flung in his face. Ugly words are trumped by even worse revelations. Friendship’s mansion proves to be a house of cards, and its collapse is swift, shattering, ruinous. Of disgrace, of shame and blood animosity, there is plenty to go around. Benim Foster is disarmingly blasé as the Jewish intellectual who thinks he gets the Muslim soul because he’s read all the secondary sources, just not the Koran. Alana Arenas is likewise convincing as the black woman who has actually made it to the place where Amir desperately wants to be. But it is benign Emily, the white wife who seems to harbor no ill will toward anyone, who delivers the unkindest cut of all. Can a complete ethnic melding ever happen in America? Is that even something to wish for? And will we ever just get along? Amir’s teenage nephew (Behzad Dabu), a Pakistani visitor who endures his own overt profiling while observing the effects of more subtle bias against his uncle, sees a clear answer to all those questions. Amir looks upon himself and sees an American dreamer stabbed through the heart. Director Kimberly Senior builds the production with a sure sense of pace and gathering tension through its unbroken sweep of 75 minutes. Set designer Jack Magaw’s stylish apartment reinforces the illusion of permanence. It is a proper house of cards. The Araca Group produces shows on Broadway: Read about it here.